IRC, or internet relay chat, can be bewildering when you connect for the first time, so this guide will help familiarise you with what to expect, how it works, how to get the most out of it, and the benefits of using an irc client. I'll avoid using jargon, and if I do, I'll explain it. You can connect to irc from RC, SB, and a number of other websites. 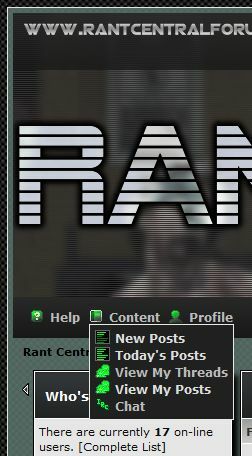 To connect to RC chat, go to the main page, or better yet, open another RC tab so you can stay connected for a while, even if you log out of the rc forum, and click 'content,' and then 'chat' on the drop-down menu. Once you choose your username, hit connect, and you're on irc. When you connect this way, the page will be blank, and the first thing that hits you is the list of names on the right of the page. Who are all these people? Why aren't they talking? Is it me? These are common questions so don't worry. The names with a '@' next to them are all channel operators (OP's), who have the power to give voice '+' (trusted status), remove status, and kick a user off the chan (channel) and even ban them. Some users come on the chans and hijack it. They post spam, or more often than not, they bore the pants off everyone either by droning on about something and not giving anyone else the chance to talk, or they become insulting and downright nasty. This is known as 'flooding,' and it pisses the OP's off no end, who will then warn the user in question, then kick them off. Having a '+' next to your name means that in the event of a chan being flooded, or it suddenly becomes 'moderated,' those with a + can still speak while those who don't, won't. Be careful when posting a link, if it's a very long image link for example, you could find yourself kicked off the chan. 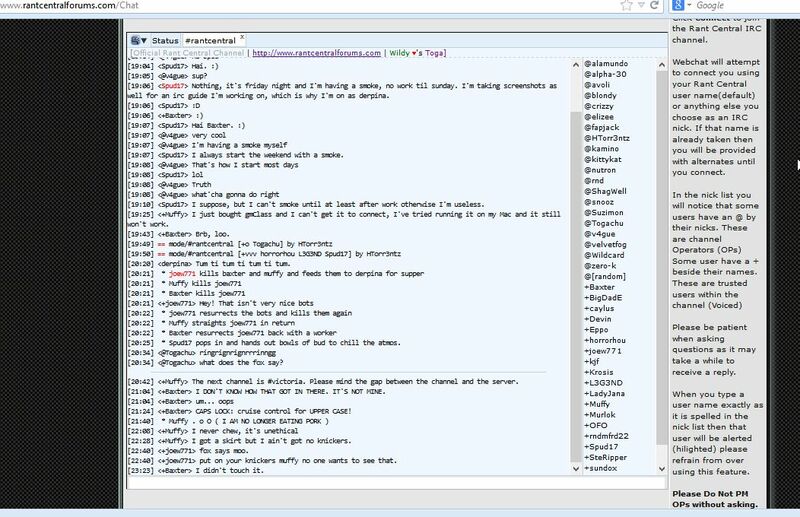 The best thing to do when you connect to rc chat is to keep the tab open for a while, so you can lurk around watching the convo take place, and jump in whenever you feel like it. Not everyone on the list of names will be online when you connect. Depending on the time zone they're in, they could be in bed, at work, anywhere, so don't assume users on the list are simply around but not talking. Many regular irc users get themselves an irc client, and a BNC, so they never have to miss any convo, which can be retrieved in logs. The second I wake up, I open Mirc (an irc client that I use and recommend) and don't close it until I sleep. When I return from work every day, the convo is there for me to read, as though I had never left my keyboard. You can highlight individual users in different colours, you can adjust sound settings so that when another user alerts you, your computer 'dings,' and overall having an irc client is a million times better than simply connecting without one. 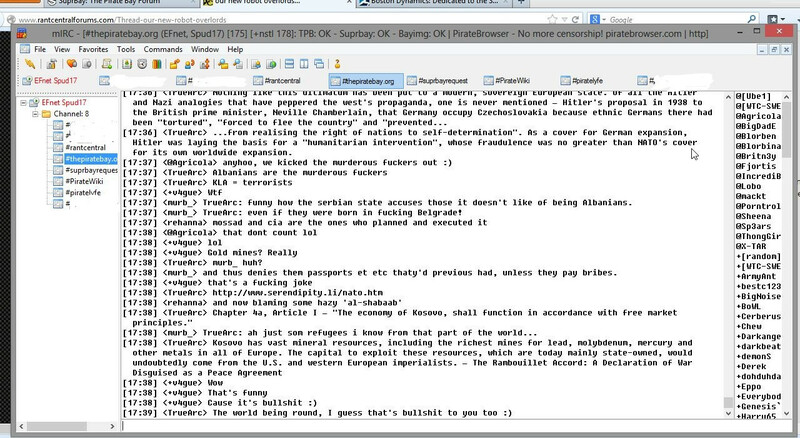 One of the things you'll notice on irc is the speed in which people type, as it's real-time chat. Uptight grammar nazis had better leave their hang ups at the point of connection, because they won't get far if they start correcting people's grammar or spelling. Grammar nazis are uneducated and narcissistic to begin with, but to expect all irc users to be perfect native english speakers is a no-brainer. English is the language used on irc, but not everyone's native tongue is english. Abbreviations are used a lot on irc simply to save time, and if you're not sure what they mean, just ask. To join other chans, it's the same command minus the name. Be careful when typing out your chan. If you make a spelling mistake, you could end up on a ghost chan. I once typed 'thepiratebay' (leaving the .org out) and found myself on a chan with about 10 other people who had all mistyped the name of the chan like me. If you do that, just 'x' the chan and retype the command. You may receive invites to join private chans, so checking your typing before hitting 'enter' is even more important. If anyone has any questions, please post here and ask. I've left some stuff out because I don't want this to be overwhelming to noobs, but once you connect, you're bound to have some questions. That's what this thread is for, so please ask, or share your experiences and tips. The more people who join rc chat and become regular active users, the better, because there's a whole world beyond posting on the forums. Jump in and join us! Baxter and Muffy are RC bots, and are pretty friendly, unless they're in a mood. Great job with this tutorial. If anyone has any questions that aren't covered in those links, feel free to ask here. (10-30-2013, 07:24 PM)Wildcard Wrote: Great job with this tutorial. Spud does a great job with most everything she creates for us. Thanks Spud. You are the best! Oops! I sure don't understand how to send smiles. I'm so imbarassed. Awesome info @Spud17 . Thanks!